Women’s lifestyle site PopSugarhas relaunched its "PopSugar Moms" vertical as "PopSugar Family," to incorporate more diverse parenting communities. H&M is the launch partner of the rebranded vertical and is sponsoring native content within PopSugar Family. Today, 46% of kids under age 18 are raised at home with two heterosexual parents in their first marriage. In 1980, it was 61%, according to Pew Research Center data cited by PopSugar. 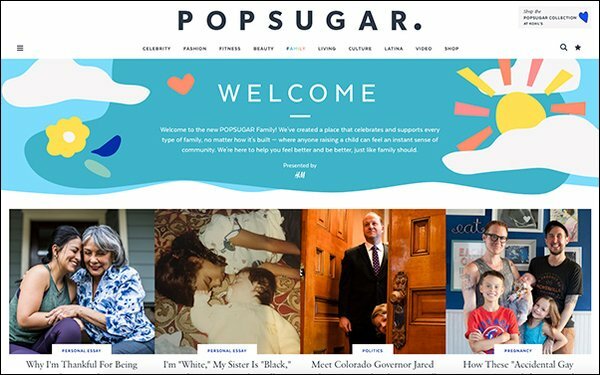 PopSugar Family will now feature stories of grandparents and friends who act as primary caregivers, LGBTQ+ parents, single parents, non-married couples and biracial couples, for example. “The list is endless. We felt speaking to only moms was being insensitive to the millions of other parents interested in learning more,” Sugar told Publishers Daily. The vertical will also tackle topics like fertility challenges, surrogacy, adoption and raising special-needs children. Sugar said the company’s own internal teams were not fully represented in PopSugar Moms, nor were the family and friends around them. “Most families in the U.S. today are not made up of what has historically been considered to be ‘traditional’ heterosexual couples, and our content needs to reflect what’s really going on with our audience,” Sugar said. The company will also create an editorial photo library of diverse families, produced and shot internally. They will appear on PopSugar Family and be available for licensing by other media outlets. “We feel there are not enough inclusive images of families available, and we are investigating best channels,” Sugar said. In addition to personal family stories by PopSugar contributors, the vertical will feature celebrities sharing their parenting journeys. PopSugar Inc. also owns a quarterly subscription box PopSugar Must Have, makeup line Beauty by PopSugar and the PopSugar Collection at Kohl's.